Situated between reality and virtual reality, this work plays with the feeling of perception and infinite space. The setup has real-time anamorphic custom software computing the perspective of the nearest person. Through four-channel immersive 3D-spatialized sound, people can experience and discover virtual audioreactive landscapes by simply moving in space. 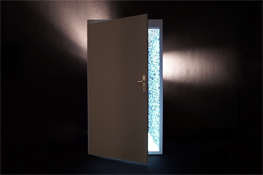 Doors is an ongoing work from THÉORIZ Studio's research and development department. Approaching view of Doors in the SIGGRAPH'16 gallery. A crowd gathers around Doors in the SIGGRAPH'16 gallery.